standing on the diving board. I wrote the above poem in 2002. My poem and Ian McNemar's photo fit how I feel now: apprehensive, uncertain, hopeful, determined. In May, I wrote about identity and change. Whether to make a major change in our life has continued to be our daily debate. We've been in Japan for seven years now. I have grown into a comfortable routine. When I was in fourth grade, I almost drowned after going down the slide into the deep end of the pool. That lead to immediate swimming lessons. Once we had learned to swim, we had to take one final test: the high dive. Change feels like that first jump off of the Olympic-like high dive. 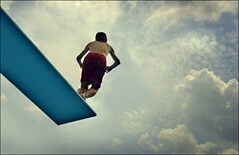 Standing at the edge of the diving board, high above the water, the idea of letting go and jumping was my biggest fear. The teacher counted down, 3 ... 2 ...1. I hesitated and she shouted, "You'll be O.K. You can swim." So that is what we are going to do . . . jump. Trusting that all the preparation we've done will guide us and bring us to a safe landing. 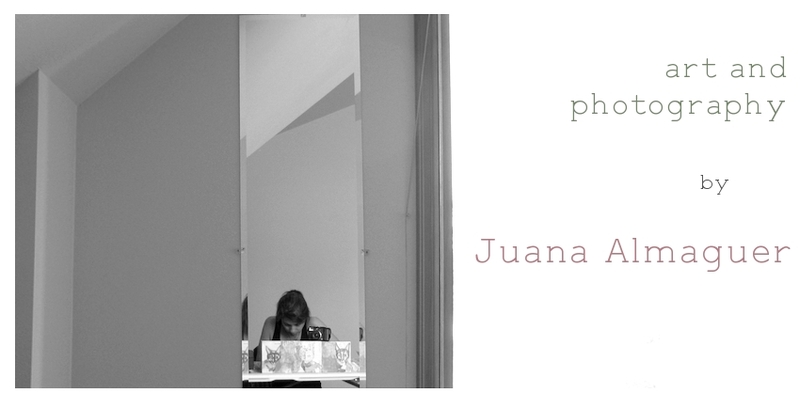 Juana - I hope everything goes according to your plans. Good luck. Praying things go well with your move! Thank you everyone for the best wishes. Tracy, yes, we have been gearing up for this since last year, but didn't resign from our jobs until last month. Now it's a sprint to moving day. wow, brave you! good for you that's what keeps life interesting. we'll look forward to hearing about your adventures. wishing you lots of good luck and fun! Congrats on coming to a decision! it must be quite a change. Good luck with everything. Where in Mexico?